Einstein theory of Relativity - Universe Galaxies And Stars Section. Einstein theory of Relativity: Frame Dragging Confirmed. An international team of NASA and university researchers has found the first direct evidence the Earth is dragging space and time around itself as it rotates. The researchers believe they have measured the effect, first predicted in 1918 by using Einstein's theory of general relativity, by precisely observing shifts in the orbits of two Earth-orbiting laser-ranging satellites. The researchers observed the orbits of the Laser Geodynamics satellite I (LAGEOS I), a NASA spacecraft, and LAGEOS II, a joint NASA/Italian Space Agency (ASI) spacecraft. The research, reported in the journal Nature, is the first accurate measurement of a bizarre effect that predicts a rotating mass will drag space around it. The Lense-Thirring Effect is also known as frame dragging. The team was led by Dr. Ignazio Ciufolini of the University of Lecce, Italy, and Dr. Erricos C. Pavlis of the Joint Center for Earth System Technology, a research collaboration between NASA's Goddard Space Flight Center, Greenbelt, Md., and the University of Maryland Baltimore County. "General relativity predicts massive rotating objects should drag space-time around themselves as they rotate," Pavlis said. "Frame dragging is like what happens if a bowling ball spins in a thick fluid such as molasses. As the ball spins, it pulls the molasses around itself. Anything stuck in the molasses will also move around the ball. Similarly, as the Earth rotates, it pulls space-time in its vicinity around itself. This will shift the orbits of satellites near Earth." The study is a follow-up to earlier work in 1998 where the authors' team reported the first direct detection of the effect. The previous measurement was much less accurate than the current work, due to inaccuracies in the gravitational model available at the time. Data from NASA's GRACE mission allowed for a vast improvement in the accuracy of new models, which made this new result possible. "We found the plane of the orbits of LAGEOS I and II were shifted about six feet (two meters) per year in the direction of the Earth's rotation," Pavlis said. "Our measurement agrees 99 percent with what is predicted by general relativity, which is within our margin of error of plus or minus five percent. Even if the gravitational model errors are off by two or three times the officially quoted values, our measurement is still accurate to 10 percent or better." Future measurements by gravity Probe B, a NASA spacecraft launched in 2004, should reduce this error margin to less than one percent. This promises to tell researchers much more about the physics involved. Ciufolini's team, using the LAGEOS satellites, previously observed the Lense-Thirring effect. It has recently been observed around distant celestial objects with intense gravitational fields, such as black holes and Neutron stars. The new research around Earth is the first direct, precise measurement of this phenomenon at the five to 10 percent level. The team analyzed an 11-year period of laser ranging data from the LAGEOS satellites from 1993 to 2003, using a method devised by Ciufolini a decade ago. 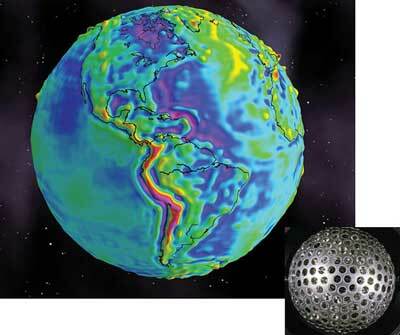 The measurements required the use of an extremely accurate model of the Earth's gravitational field, called EIGEN-GRACE02S, which became available only recently, based on an analysis of GRACE data. The model was developed at the GeoForschungs Zentrum Potsdam, Germany, by a group who are co-principal investigators of the GRACE mission along with the Center for Space Research of the University of Texas at Austin. LAGEOS II, launched in 1992, and its predecessor, LAGEOS I, launched in 1976, are passive satellites dedicated exclusively to laser ranging. The process entails sending laser pulses to the satellite from ranging stations on Earth and then recording the round-trip travel time. Given the known value for the speed of light, this measurement enables scientists to precisely determine the distances between laser ranging stations on Earth and the satellite. NASA and Stanford University, Palo Alto, Calif. developed gravity Probe B. It will precisely check tiny changes in the direction of spin of four gyroscopes contained in an Earth satellite orbiting 400-miles directly over the poles. The experiment will test two theories relating to Einstein's theory of General Relativity, including the Lense-Thirring Effect. These effects, though small for Earth, have far-reaching implications for the nature of matter and the structure of the universe.